I was driving to school this morning. I had been pulling an all-nighter, as it sometimes happens when you procrastinate and have your back up against a deadline. Anyway, as I was in the FF 2004 at a stoplight, blasting my current song of the hour (partly because it’s loud/fast and partly because I REALLY like it) I saw this young guy walking down the sidewalk. He had brown hair that kinda flopped over his right eye. He was probably in his early/mid twenties and was walking with a backpack on his back. Anyway, as he was walking down the street, the bottom ripped out of his backpack and his books fell out onto the sidewalk. Papers went EVERYWHERE. I was totally amused by this situation, but responded in my usual manner: clapping my hand over my mouth as I gasped and giggled. As he was crouched down picking up papers, he happened to glance up and catch my eye. I gave him a sympathetic smile, to which I was given the BIGGEST, MOST BEAUTIFUL smile I had seen in weeks. 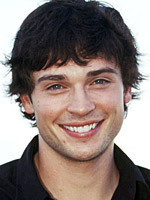 Like, we’re talking Tom-Welling-as-Clark-Kent type of smile here. The fact that the entire situation screamed “Clark Kent” didn’t help in my analysis, I’m sure. But it just adds to my theory: Klutzy guys = HOT.